TotalCare Diet Cat Hypoallergenic Complete is an all-round frozen raw meat-based meal specifically for cats that show signs of hypersensitivity to food (skin and coat issues) and/or have any gastrointestinal issues. This specific dietetic feed has been developed in collaboration with veterinarians and contains a single source of animal protein and carbohydrate sources which reduce the risk of any allergic reactions. 82% composed of equine heart, equine stomach and equine liver, potato (10%), pea (5%), salmon oil (1.0%), minerals (dicalcium phosphate), inulin (source of FOS) (0.5%), mannan-oligosaccharides (MOS) (0.15%). Suitable for kitens and adult cats with hypersensitivity reactions and/or in support of cats with gastro-intestinal issues. Store the food at -18ºC and make sure the plastic bag is resealed properly after each use. Defrost the meat in a cool place before serving it to your cat. Once thawed it can be stored in the refrigerator for two days; do not refreeze. The meat can be served raw at room temperature, no further preparation is required. Cats are very picky eaters, make sure the meat is well-thawed and at room temperature. A cat's appetite is mostly lead by scent and some cats need some time to adjust to eating raw meat. Mixing it with a treat for a few days make the transition easier! Spread the daily portion over multiple meals per day. This feed can be used as a main meal or as a variation to other food. Always ensure there is fresh drinking water at room temperature available. Any other supplemented foods are not recommended. This frozen raw meat-based meal is an excellent addition to dry dietetic food such as Prins VitalCare Diet HYPOALLERGENIC Moderate Calorie and Prins VitalCare Diet SKIN & INTESTINAL Hypoallergic. Additional information on dietetic feeds. The specific dietary purpose is reducing any intolerance of specific ingredients and/or nutrients. Essential nutritional characteristics: contains selected proteins and carbohydrates. Recommended period of use: 3 to 8 weeks. Once the signs of intolerance have disappeared, you can continue feeding this product without any limitations. With cats, contrary to dogs, it is no problem to combine dry food and raw meat during the course of the day. 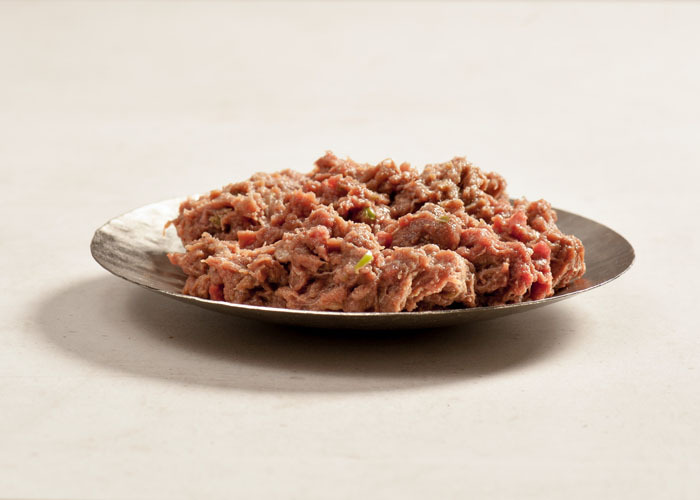 You could replace a part of the daily portion of kibble by a slice of raw meat. The meat can be served raw, withot any further preparation. Cats are very picky eaters, make sure the meat is well-thawed and at room temperature. A cat's appetite is mostly lead by scent and some cats need some time to adjust to eating raw meat. Mixing it with a treat for a few days make the transition easier! Our specially composed diet feeds have been scientifically proven, and developed in collaboration with veterinarians, scientists and universities. They are completely safe for your pet, even when used for longer periods of time.